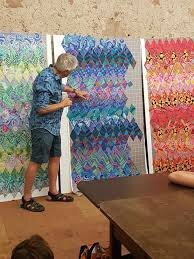 Kaffe Fassett and Brandon Mably Workshop - Green Diamonds from "Quilts in Ireland"
In each workshop, Kaffe & Brandon will teach and mentor each participant's own personal colour journey through fabric choice and placement. Each quilt workshop features a simple structure in which to explore colour. Kaffe reveals how he experiences the colours and basic shapes around him, how we can train our own eyes to see this rewarding source of creativity and how we can just as he does, combine striking fabrics with simple shapes to create our own spectacular quilt designs. In this workshop you will explore your colour palette within a diamond structure. Sew Much Fun! offers a 10% discount on class supplies. Please DO NOT precut fabrics before class!!! Bring 1/4 to 1/2 yard cuts of 20 or so different large-scale or high-profile prints mostly in a colour you prefer such as blues or reds. The prints you choose should be similar in value/tone. For example, if you would like to explore RED, bring reds, oranges, reddish purples, magenta, warm brown, etc. Your prints can be multi-colored as long as they are mostly your preferred color. If you are not sure how you are going to proceed, that's okay. You can bring your stash favorites and be prepared to shop with Kaffe and Brandon at the workshop. Please feel free to bring any fabrics you would like to use to the workshop - these do not have to be Kaffe Fassett Collective fabrics. No sewing takes place during the class. No sewing machines needed. Kaffe Fassett flannel design wall is included in the class fee and will be up and ready for your use the day of your class. A Box Lunch is included in your class fee. Please be aware that you may need/want to buy additional fabrics during the workshop. Kaffe and Brandon may advise/encourage you to purchase more on the day to get your fabric selection just right. - Clear view 60 degree triangle. - Rotary cutter with new blade. - Cutting mat - at least 12" X 18". In some cases, you may be cutting width of fabric strips. - Quilter's rotary ruler at least 6" X 18:.